You know that person in the group who usually always order "wrong" at a restaurant? Except one time I ordered the absolute best, so good, in fact, that we went back again the next day to order what I did. So, I usually let Ryan do the choosing when we do family style. He's a pro. Like last night, Ryan was craving Indian food. Indian food takes a lot of work in my mind with all those spices, you know? So we got take-out. And Ryan ordered. I chose one thing. And yes, my one thing was not so good. BUT, next door to the Indian Restaurant was an Indian grocery store. As we walked up and down the aisles and commented how Indian grocery stores tend to smell better than Asian grocery stores, I told Ryan I would make the beverage, because unlike my ordering abilities, my beverages skills are above par. Some call them mad. I think I might have perfected my Mango Lassi. Ryan said it was the best I've ever made, which is saying a lot because Ryan is a very critical cuisine critique. I think the key is using Indian yogurt, which is much thicker and more solid than what I normally buy. Blend until s m o o O o o t h and serve pronto. I made two batches to appease the miniature angry mob, which is exactly what these two large containers yield, and this Deep brand is really flavorful, although any brand we've tried works well. A mango lassi is the perfect thing to have on hand when your Dal, Paneer Masala, and Mutter Paneer are spicier than the man in the turban says they are. And don't forget the Peshwari Naan [the kind with the coconut inside]--I'd be happy with this and Mango Lassi. 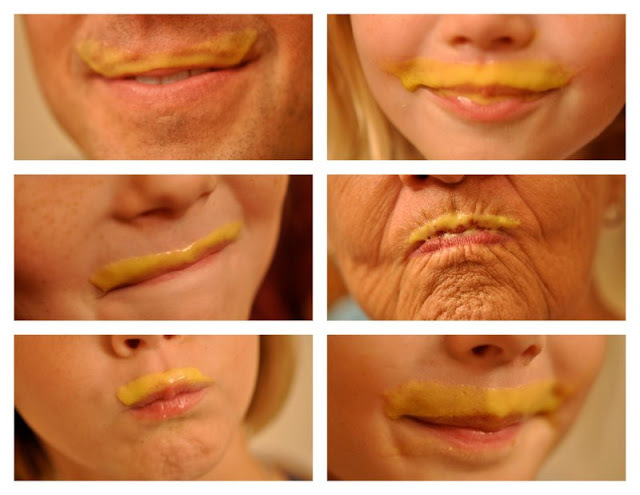 I want an orange moustache. This is awesome. My son;s class is studying India, so we're going to do a night of Indian food, games and fun facts. This will be a perfect addition. You have impeccable timing! Thank you. I do a Costco version of a lassi at least once a week for kids' breakfast. Frozen mango chunks thawed a bit, 1/2 can coconut milk, kefir, and drizzle honey to taste. Mango smoothie-ish--good way to get more Vitamin A in the belly. I got hooked on mango lassis when I lived in Japan and had access to great Indian restaurants. Now living in a secluded area of NM I have to order the mango pulp but it is always worth it. Yum! Sounds delish! My sister lives in Bangladesh, and she has me hooked on Indian cuisine. Oh, we love mango lassi's around here! My hubby and I love to go out for curry--his favorite is tikka masala and mine is coconut kurma. SO yummy. Thanks for sharing the recipe! Yummy! Wish I could find the ingredients here. :( Or some good Indian food for that matter. It's so fun to know so many other lassi lovers! We adore Indian food (just had it this past weekend), and one of my daughter's must-haves is a mango lassi. We'll be delighted to try your recipe! Yummo! Love mango. Can I guess the mouths? Mango mango, oh how I love thee! Also, I am totally loving your blog header! I am Jenny and my blog is a new-born. I do love your blog!!! Let our blogs to be friends?